I was chuffed with myself for managing to get out of my tent marginally earlier than the previous few days. However, I still needed to do much better if I wanted to reach Canada anytime soon. As I ate my breakfast and drank my coffee, I watched the sun slowly creep along the meadow. Deer grazed idly nearby. I was feeling torn by the trail. So often I want to simply chill out,take my time and really enjoy these moments and the amazing scenery. However, the trail requires that you keep moving. To make it all the way to Canada before the weather window closes I have to keep up an average of more than 20 miles a day. 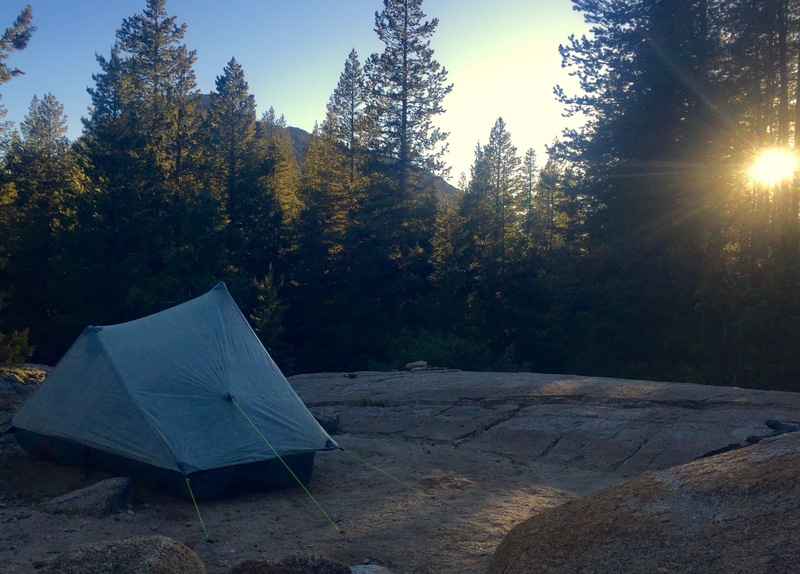 The tough and slow conditions in the High Sierras have already put me behind schedule, but now that I’ve reached Yosemite I should be able to pick up the pace and get back on track … The question is do I want to? 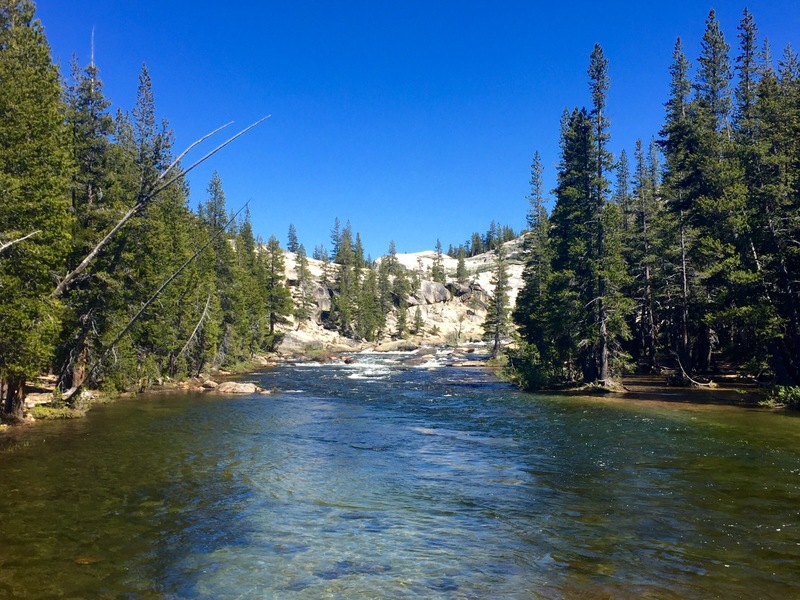 I had an easy 7 mile hike along the Lyell River to ponder my predicament. 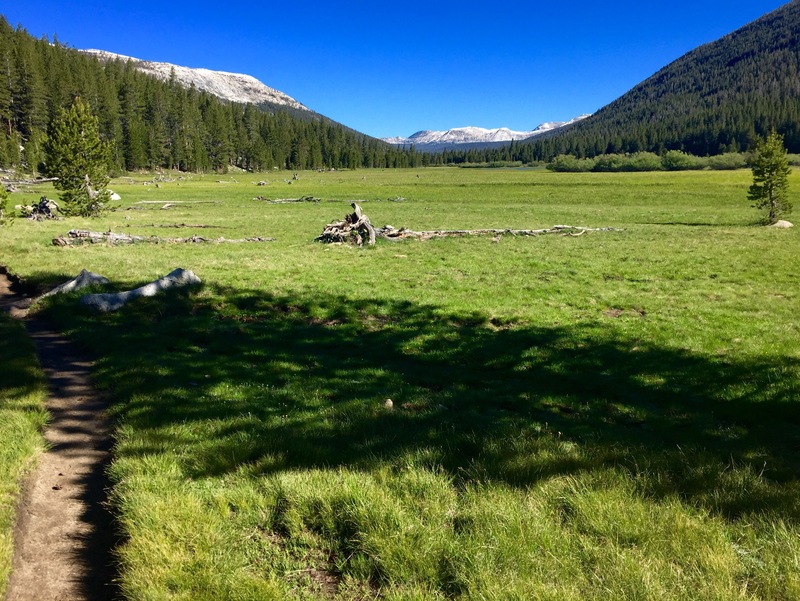 The path was swarming with JMT and weekend hikers. The signs and smells of civilization were overwhelming and by the time I reached Toulumne Meadow I was genuinely dazed and confused by the chaos and crowds. I worked quickly to check through my stupid bear thing, resupply a few essential items, eat lunch and get the hell out of there as soon as possible. Although the speed at which I wanted to hike through the wilderness was up for debate, there was certainly no question about my desire to be detatched from the “real” world. I absolutely loved camping out in the woods, even with the bears! Gin-clear rivers full of trout. As I headed out from Toulumne and deeper into the Yosemite Wilderness the scenery became more and more spectacular. The rivers ran gin-clear and teemed with brown trout. The giant cliffs and slabs of granite towered above me as I followed the mighty Toulumne River through this dramatic landscape. 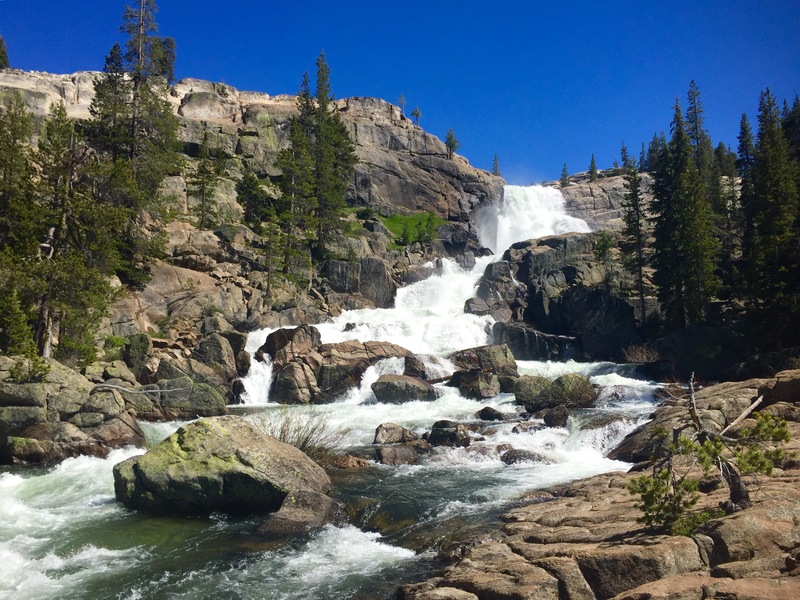 I vowed to return to Yosemite and explore the full extent of its beauty. The little that I had seen thus far really was that impressive! I pressed onwards. Hiking across the grain of the land, there were numerous steep, energy sapping ascents and descents. The trail was rocky and progress was slow. I felt drained and tired. The Glen Aulin Camp was just a few miles ahead. It certainly wouldn’t make for a “big” day but I justified stopping early on the basis that I would be getting up really early tomorrow … Right?!? 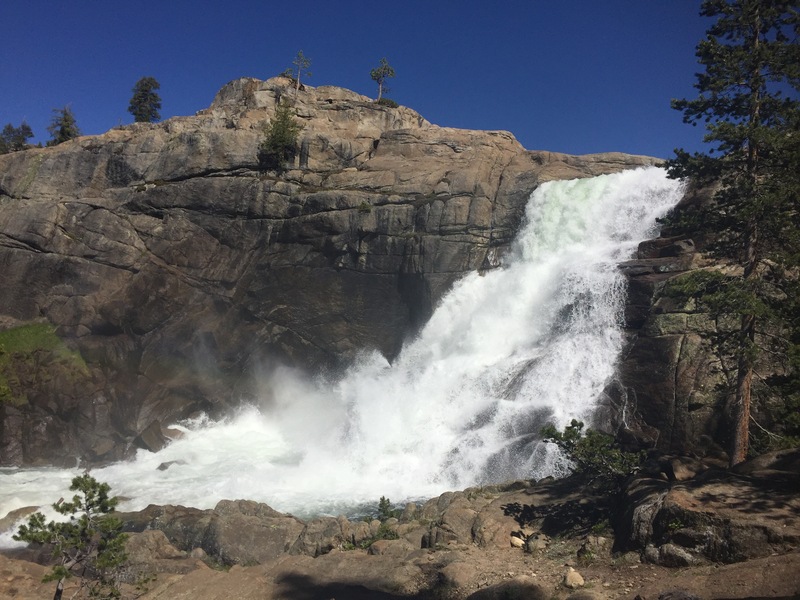 The even mightier Toulumne Falls! Just before camp the trail passed below one of the highlights of this section, the 50ft Toulumne Falls. The thunderous power of the water tumbling through the granite gorge left me gawking in awe. Curious George came along. We gawked together … Yosemite really was stunning! Curious was also heading for Glen Aulin, this allowed me to reinforce my justification for yet another day of below average mileage. Sunset over my defensive rocky outcrop. The camp was busy and the plethora of bear boxes suggested what I feared the most … there were lots of bears around. I took some comfort in the theory of safety in numbers. If I could secrete my food more effectively than just one other person in the camp, then I would surely be safe. I took up a defensive position on a rocky outcrop and ate my bland helping of Mac’n’Cheese as the sun set over this remarkable land. Tomorrow I would wake up super early and walk big miles … Yes I would! Next Post PCT Day 72 – Mozzie Madness and Trail Sadness! I could see loving the journey, the departure from the “real world.” And the sense of accomplishment. I couldn’t see doing that sort of mileage. But that’s me! I think your blog writing is excellent, you have a great, honest voice. Love the blog-great insights and pics. Warning: Tough Love Against Quitting Coming at Ya! Okay there H’wood, every time you talk about quitting I want to drop in from a helicopter and pinch you. You are your own person. Got that. But what else would you be doing? Sitting around someone’s kitchen table, sipping coffee, talking about the thing you almost did? Hell, you haven’t had one blister yet. The ones that do finish in one hike-season have, at the end, a little joyful moment of longing. Classic “what’s it all about Alfie?” They miss life on the trail that allowed a precious disconnect: its layers peeled back to simplicity, friendship, beauty, truth. The refrain lingers. They are more than they were. Try to reconnect with your posse for the comraderie. Try to remember what you started this journey for. Regroup. Own it!